Ahead of the second Perth test match, the Indian’s have been jolted in their preparation with the side suffering a setback after Rohit Sharma, Prithvi Shaw and spinner Ashwin were all ruled out due to ongoing injury issues. However, with a 1-0 lead in their basket and a prolific performance in the Adelaide test match, the visitors will be going into tomorrow’s match quietly confident of overcoming this setback and putting in another match-winning performance. Our Australia Vs India second test 2018 preview takes a look at the areas India will need to focus on as they look to script another piece of history in their cricketing books. After being decimated in their own backyard for the first time in over a decade, a hurting Australian side has decided to lay out a completely green top for the Perth test. Complete with a good tinge of grass, the brand new drop top at the Optus Stadium in Perth promises to be a typical Australian pitch, one that will offer more than its fair share of pace and bounce. Perth head curator Brett Sipthorpe has already revealed the nature of the pitch ahead of the second Test between Australia and India, starting December 14. The head curator of the stadium revealed that they were asked to make a fast bouncy pitch and that is what they have done. The move is being resorted to by Australia in a bid to play under familiar home conditions and daunt the Indian batting line-up, one that has infamously capitulated under pacey conditions. Australian captain Tim Paine has already begun trying to unfaze the Indian side ahead of the match, speaking at length about how his side will extract the most out of the conditions at hand. Meanwhile, Indian skipper Virat Kohli said that his team is excited by the prospect of bowling on a fast, bouncy track in the blockbuster second test. He was undaunted by Australia’s plan to roll out a green carpet and said that India’s versatile pace attack will be on top of their game come matchday. “We certainly get more excited than nervous looking at lively pitches now. We understand that we do have a bowling attack which can bowl the opposition out as much as they are convinced about their attack,” Kohli said. “When you have four or five fast bowlers who are at the peak of their ability, it’s always a great feeling to have in the side,” he added. 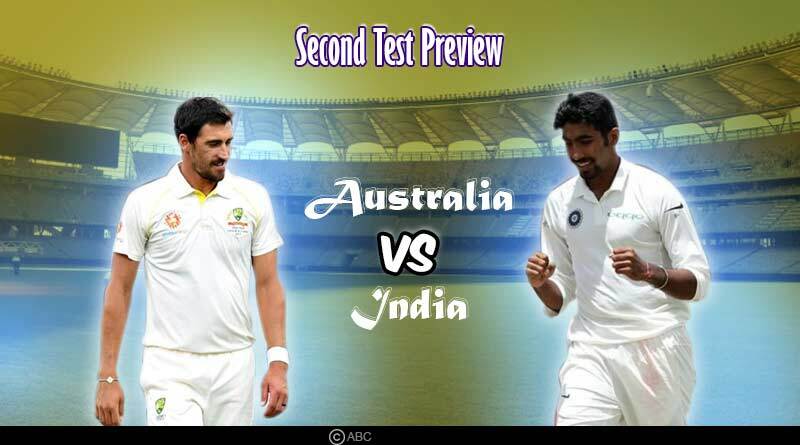 Looking to counter Australia’s plan, India is looking to fight fire with free and have recalled Bhuvneshwar Kumar to the 13 man squad as they look to go in with a four-man pace battery featuring Kumar, Jasprit Bumrah, Ishant Sharma and Mohamed Shami. The four players will be the key to India’s fortunes at the Opus Stadium and will make the ball talk with a fine seam position on a pitch where the ball promises to be frisky and misbehaved. In the Australia Vs India second test 2018 preview, we take a look at India’s batting line-up which has a more crucial role to play than the bowlers. While the new drop-in pitch is the talk of the town, India’s batting unit will need to build their foundation around Cheteshwar Pujara and Virat Kohli who will be the fulcrum of India’s efforts with the bat. It is important for the top and middle order to work in unison and contribute equally to India’s cause. The Perth pitch will be a real test of India’s application and readiness to grind out tough innings on a bowling friendly pitch, a test that they’ll need to pass successfully and not collapse as they have in recent time. Marcus Harris, Aaron Finch, Usman Khawaja, Shaun Marsh, Peter Handscomb, Travis Head, Tim Paine (c), Pat Cummins, Mitchell Starc, Nathan Lyon, Josh Hazlewood.